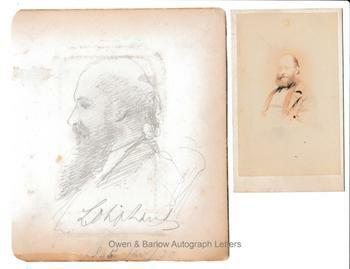 EDWARD LEAR Autograph Letter Signed with Drawing by Lear and Portrait Photograph. English artist, illustrator, author and poet, renowned today primarily for his literary nonsense in poetry and prose, especially his limericks, a form he popularised. ALS. 2pp. 15 Stratford Place, Oxford Street, W. June 18th 1866. To "Dear Lady Rawlinson" [Louisa Caroline Harcourt Rawlinson, nee Seymour]. "The accompanying Alphabet is an offering towards the education of your son, of which I beg you to accept. I made his acquaintance at Knoyle last Autumn, when you and Sir Henry Rawlinson were absent from home. I think - if the Alphabet is worth keeping - it will be worth pasting a course Holland, the edges of which may be bound round with a blue or red binding, when the whole may be stitched with one volume, presenting a cheerful appearance to the youthful mind and preserving the contents from sudden and total destruction by youthful fingers. I was sorry to find Mrs Seymour was poorly when I called a few days back Believe me, yours very truly, Edward Lear." 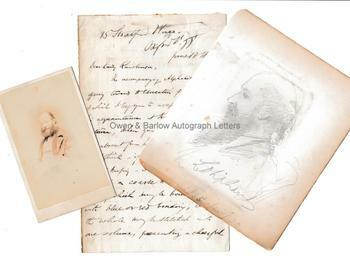 Together with a drawing that was mounted with Lear's letter and photograph in Lady Rawlinson's album and, almost certainly, is by Edward Lear. The drawing is of a bearded, balding man. 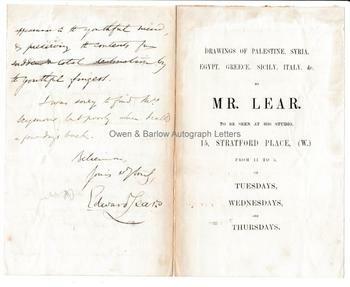 It is not signed by Lear but bears a caption in his hand and the date January 30th 1865. The writing is difficult to discern but a Lear scholar and biographer, more familiar than we with his hand, ventures to suggest that this reads "L[or]d High Handy" which, if correct, is a typical Learism. Who Lord High-Handy might be we have been unable to discover. Together with a carte de visite portrait photograph of Edward Lear by Maclean, Meluish and Haes. The letter is 8vo bifolium, the 2nd leaf of which is a printed announcement of his exhibition of views in Palestine, Syria, Egypt, Greece, Sicily, Italy, etc at his studios. It measures 18 x 11 cms (7 x 4.5 inches). The leaves are partially separated along central fold line and have old mounting residue to the blank verso. The drawing is on smooth album paper and measures 14 x 12 cms (5.5 x 4.75 inches). It has some old offsetting, browning to bottom edge and some light mounting traces to verso. Both are else in very good condition. The carte de visite is in fine condition. Provenance: From a 19th century album compiled by Lady Louisa Caroline Harcourt Rawlinson (nee Seymour), wife of Maj-Gen Sir Henry Creswick Rawlinson (1810-1895). Sir Henry Rawlinson was a British politician and orientalist, sometimes described as 'the father of Assyriology'. Lear was a visitor to Lady Rawlinson's ancestral home, Knoyle House in Wiltshire. The house was demolished in 1954.